How can municipalities and water authorities ensure climate adaptive measures by owners of private assets as part of local regeneration projects, urban transformation and change projects across the city? Currently, they can draw on experiences in pilots and projects, but as yet there is no overview of the lessons learned and focus points. 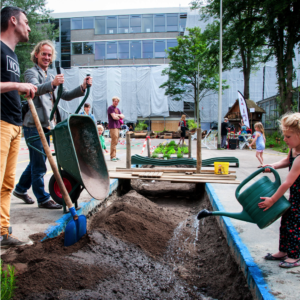 NextGreen is interviewing Amsterdam experts about their experiences, the lessons learned and the upscaling potential of instruments such as the water-neutral building envelope, the ‘plot passport’ and a sustainable sewerage levy. We are converting these insights into a framework, and creating a decision-support system (decision model) to enable the customized application of the available instruments that is tailored to the local situation. This includes factors such as the plot and its geography, the local land use plan, investment ambitions, risk considerations and the anticipated level of acceptance by other public and private parties. We also focus on the extent to which instruments are legally binding or incentivizing and to what extent they can be combined. The framework and the decision model relates to existing overviews of instruments such as the Roadmap for Climate-Robust Local Regenerationof the City Deal Climate Adaptation. Waternet (local water board), the City of Amsterdam, Amsterdam Rainproof, City Deal Climate Adaptation, Heijmans and BPD. To create a shared overview and to provide insight into the functioning of public-private instruments designed to ensure climate adaptation in the private sector. Soon we will show the first results of this project.